Before faceless multiplexes became the norm, one could always spot a movie theater in the distance, even if it was your first visit to that town. A large illuminated vertical sign announced the name of the cinema, and the triangular marquee below was lined with tiny blinking light bulbs. Even if the film being shown was a dud, that sign out front just lured you inside. And that was just one of the trimmings that used to make “going to the movies” an event, a night out on the town. If you remember when an usher would scold you for speaking too loud, or had a grandma who had a full set of china only because she’d faithfully attended weeks of Dish Nights, these 11 artifacts might bring back some fond memories. As patrons entered the movie theater prior to showtime, they naturally lowered their voices and spoke in hushed tones as they found their seats. There was something about the lush, heavy red velvet curtain covering the screen that gave the auditorium an aura of majesty and demanded that people be on their best behavior. When folks were seated, they talked quietly among themselves, which was possible because the latest pop hits weren’t blaring out of oversized sub-woofers. If there was any soundtrack, it was atmospheric Muzak playing softly in the background. When the lights dimmed and the curtains parted with a flourish, the audience fell silent in anticipation. Curtains haven’t covered movie screens since theater owners figured out how to turn those screens into temporary billboards. Today the screen is almost never blank; if the main feature isn’t showing, then a constant slideshow of advertisements and trivia questions is. Those gallant men and women who escorted you to your seats at the cinema used to dress in more finery than a decorated soldier. But that was at a time when movie ushers did much more than tear tickets and sweep up spilled popcorn; they kept an eye out for miscreants attempting to sneak in without paying, offered a helpful elbow to steady women walking down the steeply inclined aisle in high-heeled shoes, and were quick to “Shhh!” folks who talked during the movie. Ushers carried small flashlights to guide patrons who arrived after the movie had started, and they were also the ones who maintained order when the film broke and the audience grew ornery. Of course, cell phones hadn’t yet been invented, so doctors or parents who’d left youngsters home with a babysitter often mentioned such to the usher as they were seated, so he’d be able to find them during the show if an emergency phone call was received for them at the box office. One gimmick that kept movie theaters operating during the very lean 1930s was Dish Night. Money was obviously very tight during the Great Depression, and families had to be extremely cautious when it came to any discretionary spending. A night out at the movies was an unnecessary luxury, and cinema audiences dwindled. Theater owners lowered their ticket prices as much as they could (sometimes as low as 10 cents for an evening feature), but what finally put bodies in seats was Dish Night. Salem China and a few other manufacturers of finer dinnerware struck deals with theaters across the U.S., selling the theater owner their wares at wholesale and allowing their products to be given away as premiums with each ticket sold. Sure enough, soon housewives were demanding that their husbands take them out to the Bijou every week in order to get a coffee cup, saucer, gravy boat, or dinner plate to complete their place setting. One Seattle theater owner reported by distributing 1000 pieces of china costing him $110 on a Monday night, he took in $300—a whopping $250 more than he’d made the previous Monday. Movie theater seats didn’t come equipped with cup holders until the late 1960s, and even then it was something of a novelty that only newer cinemas boasted. What every seat did have for many decades before then, however, was a built-in ashtray. You can probably guess why that particular convenience has gone the way of the dodo bird: fire regulations and second-hand smoke dangers and all that. Before TV became ubiquitous, most Americans had to get their breaking news from the radio or the daily newspaper. But neither one of those sources came equipped with moving pictures. Hence, the newsreel, a brief “you are there” update on what was going on in the world, was invented. Newsreels were commonly shown prior to the main feature and was the only way most people first saw actual film footage of events like the Hindenburg explosion or the Olympic games. Movie patrons of yore certainly got a lot of bang for their buck (actually, more like their 50 cents) back in the day. Very rarely would a cinema dare to show just a single motion picture—patrons expected a cartoon or two after the newsreel, and then a double feature. That is, two movies for the price of one. Usually the second film was one that wasn’t quite as new or perhaps as prestigious as the main attraction, which is why we oldsters sometimes still describe a bad B-movie as “third on the bill at a double feature." A staple of the Kiddie Matinee was the Chapter Play, or Serial. Always filled with action and adventure, and either cowboys or space creatures, these 20-minute shorts were continuing stories that ended each installment with a cliff-hanger. And if even if the producers sometimes cheated and the hero managed to survive an automobile explosion even though he hadn’t gotten out of the cockadoodie car in last week’s episode, kids made sure they got their chores done and weekly allowance in hand early each Saturday. No one wanted to be the only kid on the playground Monday who hadn’t seen Crash Corrigan battle Unga Khan and his Black Robe Army. 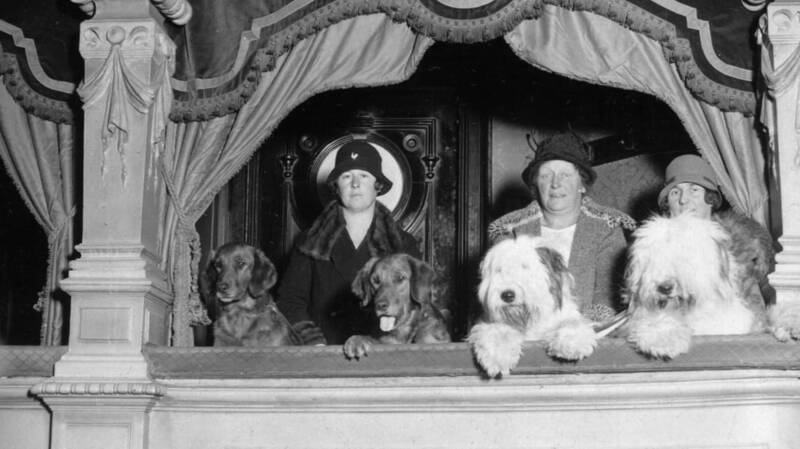 Going to the movies was a much more formal occasion in the 1920s and '30s, and even the 1950s. Ladies and gentlemen dressed accordingly—women in dresses or smart suits (never their house dress that they wore while washing the dishes and vacuuming) and men in suits and ties. And no man nor woman would leave the house without a hat completing their outfit. As fashions evolved, women’s chapeaus went from big to huge to ridiculously elaborate and back to tastefully understated (think Jackie Kennedy’s famous pillbox), while men had a more limited selection—the straw boater, the derby, the fedora. During those hat-wearing decades, blocking the field of vision of those sitting behind you was a very real problem, and it was just plain good form for men to place their hats in their laps during the film. Women, on the other hand, were more reluctant to doff their headgear—it was a part of their fashion statement, after all, and quite often a lady had said hat very intricately pinned in place. Thus the admonition for ladies to remove their hats during the show was born. Remember what we said above about double features and serials and such? During that era, the projectionist needed time to change reels, which resulted in five or 10 minutes of “dead air.” Theaters put that down time to good use by rolling promotional reels to remind patrons of the cornucopia of delicious snacks just waiting for them at the concession stand. There’s a reason that some of the larger downtown theaters in big cities were called movie palaces—thanks to elaborate architecture and decorating the Riviera or the Majestic were probably the closest most Americans would get to a palatial setting. Such cinemas were called “atmospheric theaters” because they were built and decorated with a theme, often one featuring a foreign locale such as a Spanish courtyard or a South Asian temple. Atmospheric theaters had lobbies that were several stories tall with one or more grand chandeliers hanging from the ceiling. No wonder folks dressed to go to the movies back then; wouldn’t you feel out of place wearing jeans and a baseball cap amid such splendor? Those elaborate movie palaces had many amenities that not every neighborhood theater had, including “cry rooms.” A cry room was a soundproofed elevated room in the back of the theater with a large glass window in front so Mama could still watch the movie (and hear it over a public address system) while trying to calm down a fussy baby. Many theatres that provided cry rooms also came equipped with electric bottle warmers, complimentary formula, and a nurse on duty.